At most events the early bird gets the best seat. Not necessarily so at the Apalachicola-based Florida Seafood Festival oyster eating contest. Front row and center can sometimes be less than appealing. You see, the object of this contest is to see how many oysters can be consumed by contestants during a 15-minute span. This is not a casual pick an oyster from the shell and put it on a cracker competition. The oysters are guzzled. The big, juicy, slightly salty oysters are shucked in advance, counted, and placed in paper cups. Combatants then shovel them down. The only rule is that they must stay down. Contestants have been known to disobey this prime directive. A dozen or more men and women usually compete in the Saturday mid-day event which draws thousands of cheering spectators. 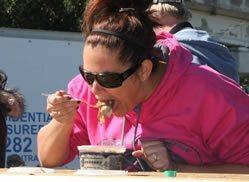 Some of the more competitive eaters consume more than 250 to 300 oysters during the competition.